The Best of Teacher Entrepreneurs III: Why do you get a Positive Answer? Inquiring Minds ~ "Why do you get a Positive Answer?" My students had a hard time understanding why you get a positive answer when you subtract a negative in some situations.... for example 2 - -5 = 7. "Keep ~ Change ~ Change", just did not make sense to them (of course they used the K-C-C method and memorized it - but it just didn't make sense to them). I always remembered the rules and never questioned why this happens ~ loved that some of my students (especially one) really wanted to know "why" and wanted eagerly to understand this situation. Therefore, I explained the hot air balloon method..... then recently thinking about it some more... came up with the 'Ladder Method' which I do believe they would understand. Plus, this integrates vertical graphing!!! (YEAH, integrating positives, negatives, graphing, understanding). Explanation is below the photo of the ladder method. 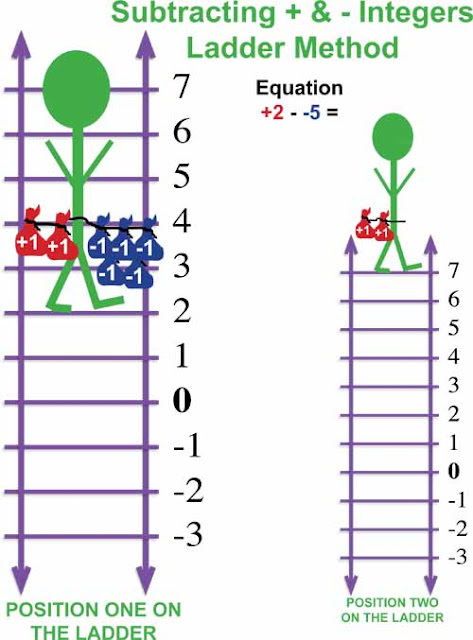 This may not always be the case either - that you get a positive answer if you subtract a negative... For example -9 - -5 = -4, yet the Ladder Method still works.... You would be standing on -9 rung of the ladder and release -5 bags, therefore, you can go up to -4. What do you think? Would you explain it that way? Are there other ways you've explained it?